Many of you are already familiar with Nikki Sherritt via her line of all natural candles at her etsy site, Gabriel’s Aunt. She also creates botanical perfumes and recently established a separate shop, Rebel and Mercury, in order to better feature her line of fragrances. The name seems to suit her perfectly since it reflects Nikki’s independent and evolving creative spirit. When Nikki launched Rebel and Mercury back in June, she sent me a sample of a new fragrance, Var en Provence. When it arrived, I was too busy with travel and work to spend quality time with the fragrance, but luckily the sample of Var en Provence caught my eye last week and I’ve been able to hang out with this perfect summer scent and get to know it a lot better. To my nose, Var en Provence falls squarely in my favorite genre, the woody floral perfume. Having said that, I’m not certain of the woods in this perfume and I wonder if it’s the orris root and olive leaf that merge into a basalmic and herbal accord. But let’s get to the floral aspect first. 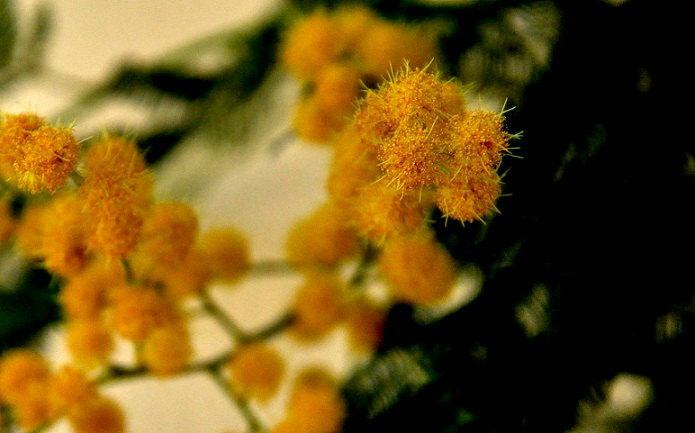 Mimosa is the focal point of Var en Provence and it glimmers in the soft light of Southern France. Fortunately, this is a soft-focus mimosa and not at all high pitched which is often the case. The mimosa in Var en Provence is definitely sweet, but it’s a gauzy draping of honeyed blossoms that feels very wearable and appealing. Going back to the woody floral discussion, and I’d like to clarify that those balsamic nuances are present only in the opening of the fragrance which I find very interesting as wood essences tend to be basenotes. But as I said, the earthy, almost mushroomy quality of orris combined with the herbaceous olive leaf hover around the opening notes and then dissipate as the heart opens to the soft and plentiful mimosa flowers. The drydown continues the mimosa theme as it becomes even more powdery and floral. The final stage of Var en Provence is like a soliflore that allows for an unexpectedly serene yet intriguing mimosa experience. Clearly, I highly recommend mimosa aficionados give Var en Provence a try, and for those of you who are a little gun-shy regarding this yellow fuzzy blossom, you should give it a shot as well. Var en Provence is available at Rebel and Mercury in various sizes and price points. Disclosure: A sample was sent to me for consideration by Nikki Sherritt. The opinions in this review are my own. I was not financially compensated for this review or any other. Mimosa Flower by InFire at etsy. Previous Post What I found interesting this week. Venasque is such a unique and lovely fragrance isn’t it? I need to revisit it, it’s been too long. I love Nikki’s perfumes, but I have yet to try Var en Provence. Your phrase “gauzy draping of honeyed blossoms ” makes me want it yesterday! Var en Provence sounds lovely. This is definitely going on my purchase list. It was a real pleasure Nikki, sorry it took a while. I just found the notecard you sent along with the sample, and I saw guaiac wood listed among the notes…so it really is a woody floral! I will have to try it! And put it on my wish list along with SIP’s Arunima, which I am still yearning for, along with Fire & Cream! Meanwhile, FSW’s Moss & Ivy arrived and I am absolutely wild about it! The opening reminds me intensely of the perfume gel created by Yosh especially for Persephenie’s Blunda organic perfume gathering a few years ago. Were you here for that? Can’t remember, but LOVE the scent and it is in Moss and Ivy. Just a fairy dance in the fragrant woods for my nose! I received a sample of Tetu by JB when I took advantage of the July sale and ordered another bottle of Colette (the cepe and cognac are sooo delicious). I was at the Yosh event with you…and you’re right, there are some real similarities between those two fragrances. If you do place a sample order with Nikki, be sure to try Venasque and Bohem as well. You would love those! What did you think of Tetu? I’m so curious. I don’t know if I’ve ever smelled Colette, I will have to dig through my sample stash to see if I have it. Tetu knocked my jodhpurs off – going to have to try in small doses and see if I become a fan post dry down. I love Nikki and her perfumes seem to echo her personality: bright, cheerful and generous. Your description of her Var en Provence is lovely and has my interest piqued as I love mimosa. Sounds amazing! Charna, since you love mimosa, you must give VeP a try!